Two separate couples backpacking on vacation in Kauai cross paths while hiking a treacherous eleven mile hike to the most secluded beach in all of the Hawaiian islands. Continuing the hike together, the group later finds out from three women hiking in the opposite direction, that a honeymooning couple were murdered on another island by a unidentified white couple. The women tell the group of couples police believe that the suspects may have island jumped to Kauai. Secluded and not wanting to turn back, the two couples continue on the hike only to begin suspecting one another as they head for their perfect getaway. "The Perfect Getaway" isn't at all perfect, but it is definitely a fun ride. The thriller is instantly predictable, I'm talking opening credits, but it still gets the job done and furthermore kept me entertained all the way through. What helps make the mystery (if you can call it that) worth while is witty dialogue, dynamic performances by Steve Zahn and Timothy Olyphant and a glorious setting for the suspense drama. Director David Twohy best effort is still his film Pitch Black, but "A Perfect Getaway" had the right amount of tension, wit and enough action to keep me thoroughly engaged. The plot was simple and never became convoluted as many suspense thrillers can. The character development was impressive although, I am curious to know if Twohy intentionally put so many indicators that gave away the twists. Even though I saw every one of them a mile away, I still enjoyed the reveals and twists for what they were. 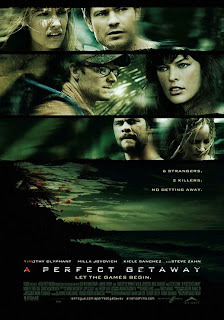 Timothy Olyphant brings his dry wit and charm here in "A Perfect Getaway" and it works flawlessly. His dialogue seems written specifically for him and Olyphant delivers it spot-on. Steve Zahn is also a pleasure to watch on screen. His character is very rigid and more subtle than Zahn normally plays, but it works very well here in the suspense thriller. Both Olyphant and Zahn do there best to mislead the viewers, but I would very surprised if you do not catch the twist at least 30 minutes into the 97 minute film. Zahn and Olyphant are very good together in the film, their chemistry is engaging and the banter written for them provides a few unexpected laughs. Unfortunately, the significant others in "A Perfect Getaway" seem like nothing more than baggage. They follow Olyphant and Zahn's lead and do little to help the film. In their defense Milla Jovovich and Kiele Sanchez are not given much to do. They share a few girl-talk scenes together and show a little skin, but other than that their performances are flat. As for the other supporting cast, Chris Hemsworth delivers a strong performance with very limited screen time as Kale and Marley Shelton (Planet Terror) was just plain annoying as his wife Cleo. Overall "A Perfect Getaway" was a fun getaway, not perfect. It had two powerful leads that were able to carry the film and keep me engaged through the finale. The reveal in the third act is stretched out a little too long and could have been substituted for more of a suspenseful pursuit, but overall it was effective to the entire plot. The movie never tried to be something it wasn't and remained simple (something Twohy should have done with the Chronicles of Riddick) and as a result the film was a enjoyable event. I would watch this film again and probably numerous times once it hits cable. A final note, I was disturbed to find out that a film boasting of a Hawaiian getaway, swindled us, and filmed the majority of the movie in Puerto Rico.